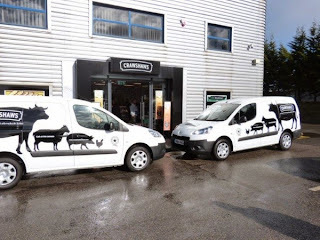 Crawshaw Group, the Rotherham-based fresh meat and food-to-go retailer, has reported a rise in earnings of 30% for the year ended January 31 2015. It recently acquired 11 more retail butchers units and a distribution centre in the North West from Gabbotts Farm Limited in a £3.9m deal. Reporting its latest financial results, Crawshaws saw sales increase by 17% to £24.6m which saw EBITDA (earning before taxes) increase 15% to £1.6m (2014: £1.4m). Excluding infrastructure costs the adjusted EBITDA was 30% higher than last year at £1.8m. Full year like for like sales were up 5% and average customer spend continues to rise and was up 3.5% to £6.22 versus last year as the retailer maintains a focus on larger value packs and multi buy offers. Customer numbers are 3.2% higher than last year driven by an improved range and consistency of a lunchtime and take home offer. The results meant that the group is proposing a dividend of 0.57p. During the year, Crawshaw moved from three separate head office and factory locations into one newly refurbished facility in Rotherham, investing £1m. This single location can now support up to 60 shops and also contains a new factory shop which is performing well above expectations. The group has also appointed Noel Collett, formerly Lidl's chief operating officer for the UK business, as chief executive officer. He joined as Crawshaws heads towards its ambitious target of 200 shops within eight years. Last year it announced details of the placing of new shares in a bid to raise nearly £9m to support the acceleration of its store opening programme. Richard Rose, chairman of Crawshaw Group, said: "I am very pleased with the progress made to date on our plans to open 200 shops. The post year end acquisition of Gabbotts Farm has provided 11 additional profitable shops and a distribution centre in the North West of England. We have also recently signed leases on new shops in Leeds and Bolton which are currently being fitted out. In addition there are a number of other locations in the process of being signed up. "It is a very exciting time for the business and whilst short term profits will be held in check for a while as we add infrastructure costs ahead of the curve, we very much look forward to reporting on our progress as we build scale as quickly as practically possible."